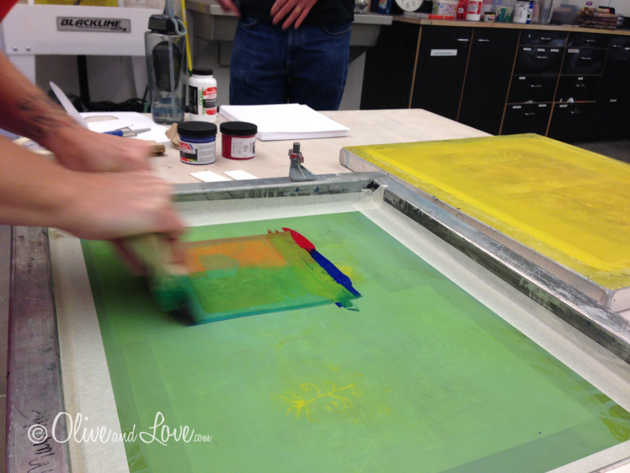 When I signed up to take Screen Printing class at the Nevada Museum of Art, I registered two classes; drawing fluid and photo emulsion. I've never done any kind of screen printing before so this post is not a tutorial but a share of my experience. I apologize for any technical details I have butchered or left out completely. If you have any information to add, comments are appreciated. Most importantly I had an enjoyable time and considered it a mind vacation. I brought with me a variety of transparencies photocopied with images I had taken previously (without this process in mind). Unfortunately I did not reduce the image to a line drawing in the proper pixel size (meaning my images still had too much detail) so I crossed my fingers for the best results. The best way to do it is to convert your photo to Bitmap on Photoshop. 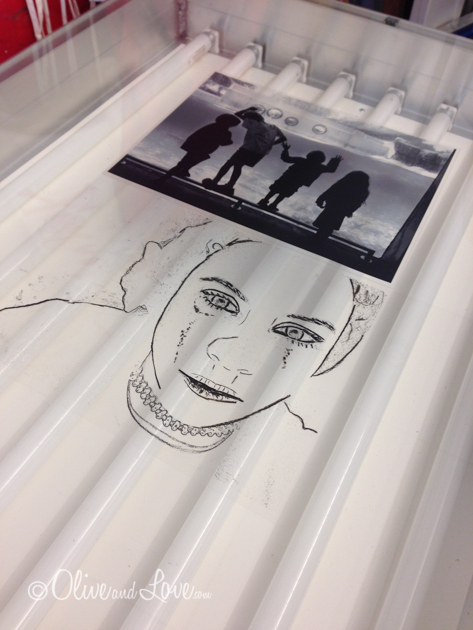 You can also draw images and photocopy or draw directly onto the transparency. I chose two unrelated images to possibly incorporate together. Our screens were prepared prior to class by our teacher, Candace Nicol. Using a squeegee or scoop coater, the screens were covered top and bottom with a thin even coat of a photosensitive substance called emulsion and a sensitizer for twelve hours. The transparencies are then placed on the mesh screen over the tanning booth light contraption (I do believe that is the proper term....not). 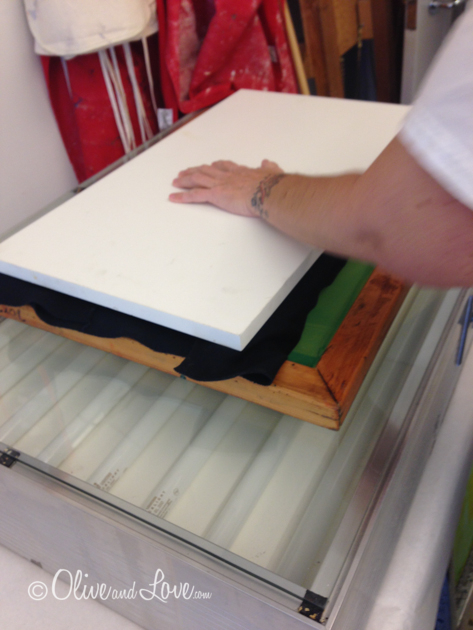 A black cloth coated foam and a board are then layered on top. 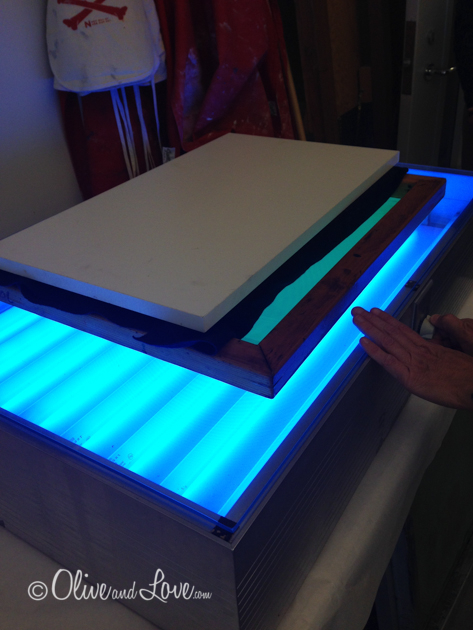 There are various ways to achieve proper light exposure at home with flood lights if you don't just happen to have a mini tanning booth. There are a variety of different mesh sizes available. 200-330 will achieve results with fine details. 120-160 will fill with out a lot of detail and 60 is for larger glitter size. 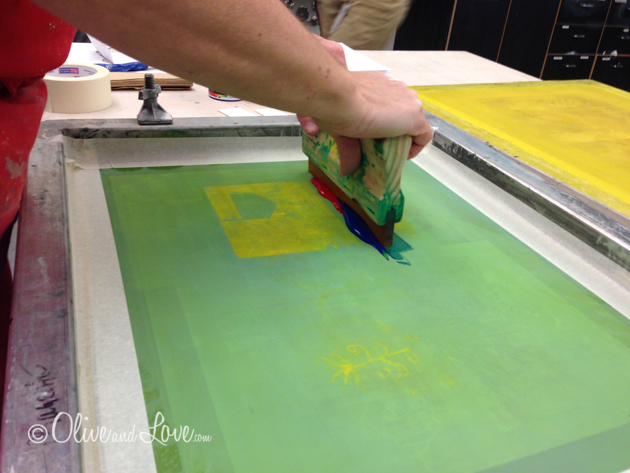 Painters tape helps to seal and protect the edges of the screen. 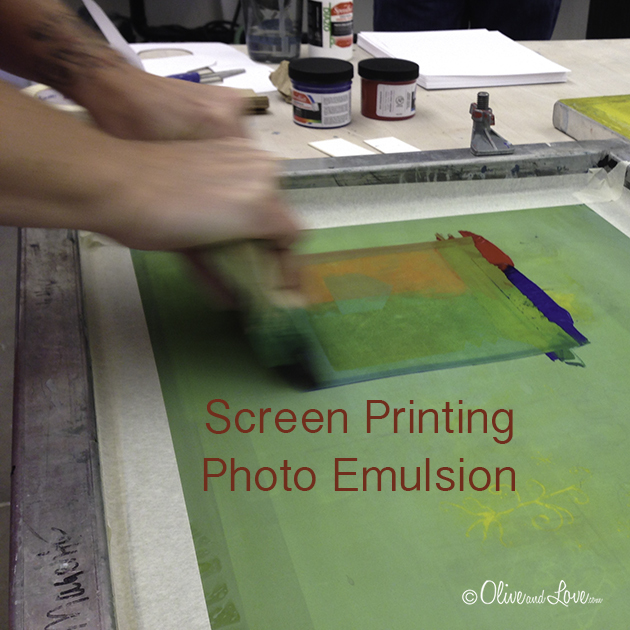 Ink is then placed on the screen and pulled down across the image (more information about screen printing), depositing ink onto the paper placed under the mesh. In the above series, instructor Candace Nicol used two inks during one swipe, giving the image blended colors. I premixed my inks to a light blue and green. 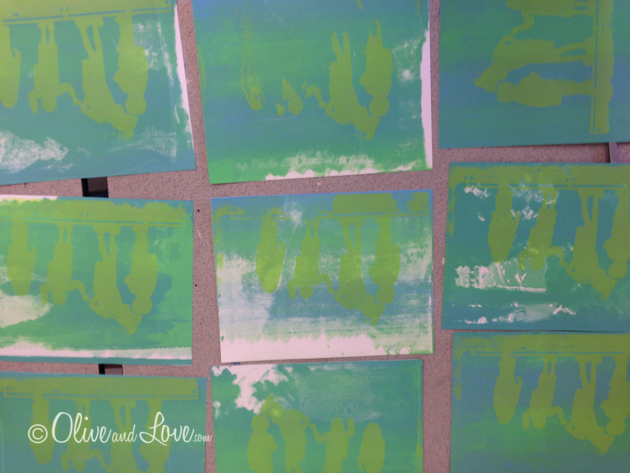 I then screen printed the whole paper as a backdrop, blending the two colors as Candace had done in her example. Next step is to screen print one of my images onto the backgrounds. I chose to start out with a lime green color. I did a second pull using the same image but with black on top of the lime green. 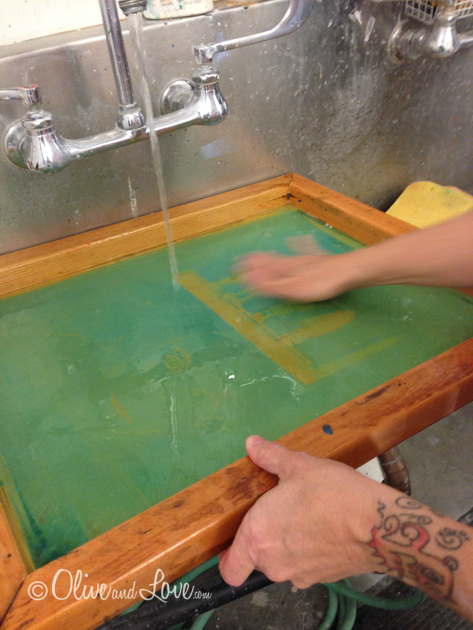 First removing as much of the green ink of the screen as possible using a towel, and then rinsing it in the sink and allowing time for it to dry. My face image didn't come out as great because of the fine detailed lines. I only used it over a couple prints.